A wardrobe essential, the 101 Denim Jacket in Studio Blue is a classic denim jacket silhouette, featuring a button up front with button chest pocket detail. Definitely satisfied, what you see in pic is what you get ! 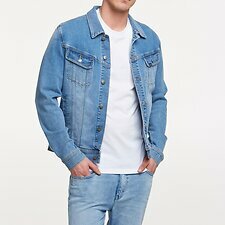 Studio blue Lee denim jacket is the best of all good .